Get BIG Spring Time Savings Throughout Our Store! 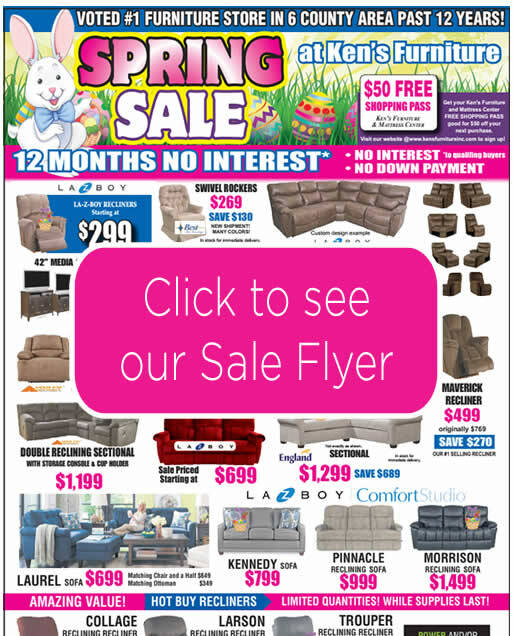 Shop Ken's Furniture and Mattress Center during our Spring Furniture & Mattress Sale and save on America's best brands of sofas, recliners, tables, chairs, dining sets, bedroom suites, entertainment furniture, and a mattress for a great night's sleep. Everything in our store is on sale for this limited time event. *With approved credit. See store for details. PLUS! Receive FREE Local delivery with your new furniture or mattress purchase*. Shop Ken's Furniture and Mattress Center today and SAVE! * No Interest Financing is available to qualified buyers. Minimum monthly payments required. See our store for details. * FREE Delivery, setup and removal is available within 50 miles of our store in Defiance, Ohio. If you live outside this area, ask us about our minimal delivery fees.